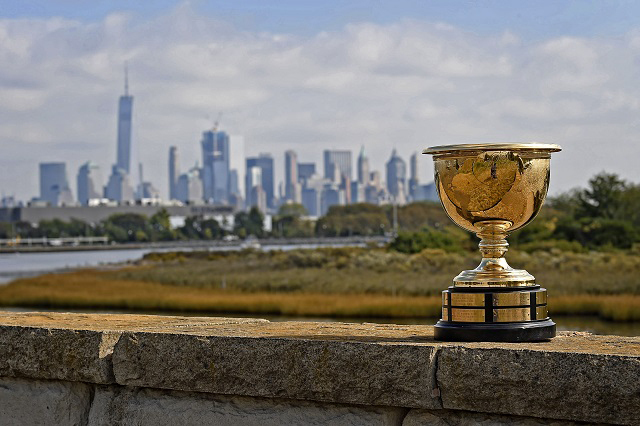 Well, the teams are set for the biannual exhibition called the Presidents Cup to be played over the Liberty National Golf Club in Jersey City, New Jersey at the end of the month. The top ten world ranked players for the International Team and the top ten point earners for the United States team have been joined by two picks by each team captain. International captain Nick Price added the 11th ranked international player, Argentina’s Emiliano Grillo and Anirban Lahiri from India who was the 16th. Though both are strong, experienced players and join a team headed by world number three Hideki Matsuyama plus Australian’s Jason Day and Adam Scott it’s hard to conceive the Internationals will prevail. The U.S. team is led by world number one Dustin Johnson followed by Open champion Jordan Spieth plus PGA champion and five-time winner this season Justin Thomas. Spots four through six are filled with players almost as impressive: Rickie Fowler, Daniel Berger and U.S. Open winner Brooks Koepka. Let’s face it that’s a strong lineup and captain Steve Stricker made predictable choices for his two picks: Charlie Hoffman, who was 11th in points and World Golf Hall of Fame member Phil Mickelson. The prediction (which isn’t really so fearless) is the United States will romp, maybe not by 11 points as in 2000 but it’s almost certain this year won’t be close. As in 2015 when Mickelson was a pick by captain Jay Haas the tsk, tsk crowd has lined up to criticize Lefty’s inclusion. They don’t remember that two years ago when he was having a singularly mediocre season with his best finish being a tie for third he went 3-0-1 in the Presidents Cup. Granted past performance is no guarantee of future success, but it’s hard to argue player with low experience should be picked over even a mediocre Hall of Famer. The other argument against Mickelson’s inclusion misses the mark entirely. I have a lot of respect for Alex Miceli but in his Morning Read column the logic was Lefty, though playing well at the Dell Technologies Championship, hasn’t had winning form since the 2013 Open and is 15th in the points list therefore younger players should be given the chance to be on the team. He’s correct that Lefty hasn’t lit it up recently though who can deny his memorable fight against Henrik Stenson for the 2016 Open shooting a final round 65. Unfortunately Stenson posted a 63 to take the Claret Jug home to Sweden but Mickelson was magnificent that Sunday to say the least. The reason Stricker picked Mickelson was not so much for his record in international team play nor the level of his game this year but because his maturity and leadership are undeniable…an immense asset to the team. If younger players should be given a chance they should just play better and get in by virtue of the points system.